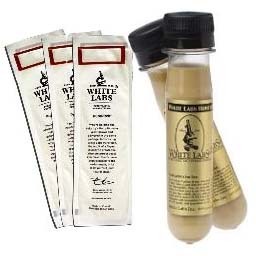 WLN4000 WHITE LABS CLARITY FERM CLARITY-FERM is a product containing a highly specific endo-protease which only cleaves polypeptides at the carboxyl end of the amino acid proline. Protease is derived from Aspergillus niger. Spec Sheets: Undiluted Regular APPLICATIONS: 1) To increase the collodial stability of beer by reducing chill haze. 2) Producing gluten reduced beers in beers made from barley and wheat. FUNCTION: Chill haze in beer results from the precipitation of complexed polyphenols and proteins during cold storage. This haze develops over time and, initially, is reversible (haze disappears when the temperature of the beer increases). Eventually this chill haze can become permanent. Clarity Ferm will prevent the precipitation of complexed polyphenols and proteins by hydrolyzing the sensitive (haze-active) polypeptides in the region where such hydrogen bonding occurs. The specificity of the enzyme ensures that no other beer parameters are affected. 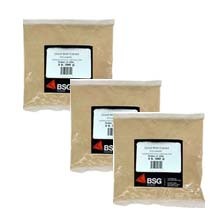 This easy-to-use enzyme can be used on all types of brewing materials and is a cost effective product to replace silica gel or PVPP. 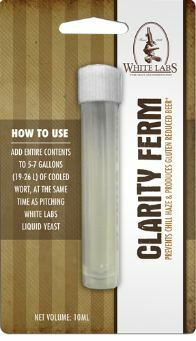 Simply add when pitching yeast, and Clarity Ferm will do its work during fermentation. When fermentation is complete, chill haze has already been addressed. In addition to eliminating chill haze, Clarity Ferm significantly reduces the gluten content in beers made with barley and wheat. A Clarity-Ferm treated beer made from barley or wheat usually tests below 20 ppm of gluten, the current international standard for gluten free. White Labs offers gluten testing for beers, this test will allow brewers to know the gluten level of the beers it produces, but brewers are not allowed to use this value on their labels until the FDA completes its validation. The TTB has issued interim labeling guidelines for beers made with gluten containing grains, and it states: "TTB will allow use of the statement 'Processed or Treated or Crafted to remove gluten,' together with a qualifying statement to inform consumers that: (1) the product was made from a grain that contains gluten; (2) there is currently no valid test to verify the gluten content of fermented products; and (3) the finished product may contain gluten." ** Contains Sodium Benzoate. The amount in Clarity-Ferm is less than 0.1%, thus meeting FDA regulations, and this amount is further and significantly diluted when put into beer.